The baseball team defeated Clark University for the first time since the 2017 season on Tuesday. Photo courtesy of Kate Foultz. The baseball team won its first conference game this season when the Lions defeated Clark University 5-2 on Tuesday night. The win puts Emerson at 1-9 in conference play and eighth in the New England Women’s and Men’s Athletic Conference, with seven conference games left in the season. 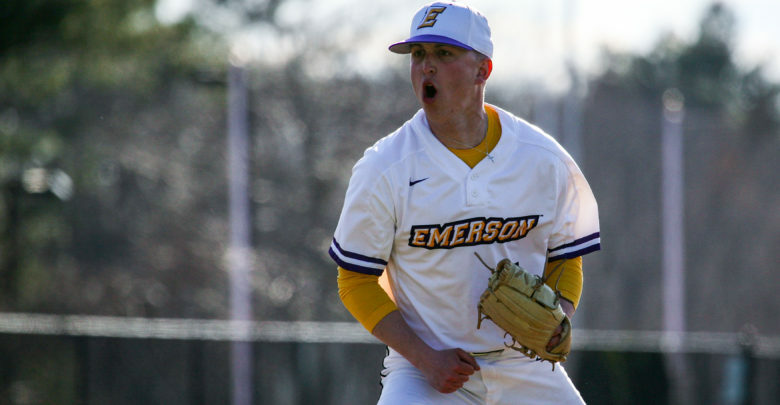 Emerson opened scoring in the top of the first inning with a single to right field by freshman outfielder Louie Davolio which brought sophomore infielder Ryan McCahan home. Clark answered back with a double by senior infielder Zachary Kelley, who drove in a run scored by junior infielder Andrew Thibault. In the top of the fourth inning, freshman outfielder Quinton Copeland gave the Lions a lead by scoring on a passed ball. Copeland later hit a leadoff home run to start the top of the sixth inning, which extended Emerson’s lead to two runs. Clark hit back with a home run of its own in the bottom of the seventh inning by sophomore outfielder Chris Radovic which dropped the lead to one. Emerson held off Clark in the eighth inning before adding on two more runs in the top of the ninth to give the Lions a three-run lead. Lions’ freshman pitcher Michael Logerwell only gave up one hit in the final two innings to earn the save. The win followed another impressive performance on the mound by junior pitcher Jack Fox. Fox went five innings and only gave up one earned run and struck out eight batters to record his third win of the season. Head coach Nick Vennochi said Fox played a vital role in the game. The Lions lost 15-1 to Wheaton College at home on Friday and will play Wheaton again on Saturday at 3 p.m., and Sunday at 12 p.m. Wheaton placed 20th in the NCAA Division III baseball national leaderboard at the time of publication.